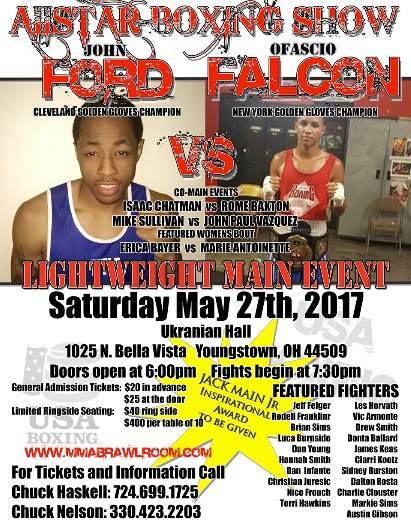 Amateur boxing will return to Youngstown's west side this upcoming Saturday evening at the Sts. Paul & Peter Ukrainian Hall in a boxing fourteen bout card being billed as All-Star Boxing Show. 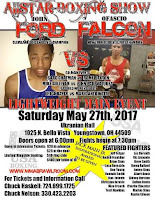 The main event for the evening is an intriguing lightweight showdown between a pair of Golden Glove Champions as the winner of the Cleveland Golden Gloves, Ryizeemmeon Ford takes on the Ofacio Falcon who won the New York City Golden Gloves tournament. Ford, 23, hails from Alliance, Ohio and has been taking a serious approach to the sport since the age of 17. Ford, who has future pro ambitions trains under Lorenzo Scott at the Common Ground Athletic Club in Alliance. Ford, however, leaves the timeline for his professional career to his handlers. "Whenever coach says it's time to go," Ford said about his future professional career "then I'll take it from there". Pittsburgh. Chatman, 20, who trains at Downtown Boxing Club will come into the match with a 20-4 record. The other co-main event will feature Mike Sullivan of Struthers. Sullivan, who trains at Burnside's Boxing Club is a former two-time champion of the KO Drugs High School Boxing Tournament. Sullivan will be taking on John Paul Vazquez from Cleveland. Tickets for the event are $25 at the door for general admission. Doors will open at 6:00 PM with matches starting at 7:30 PM. Please check back on Wednesday as we will have an interview with Ford about his career, upcoming fight, and future plans.